Rarely do fight fans get a fight that we, the public want to see. Usually the promoters in their best interest and their fight stable, create fight cards and then OCNVINCE us it’s what we want to see. They hype enough and we buy into, because we are fight fans. 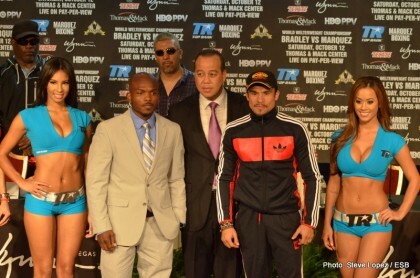 Come Saturday though, I as a fight fan will be watching with intrigue the fight between Bradley and Marquez. Both of these fighters are true warriors and will fight to the finish. We have Bradley a come forward fighter, who though claims he will not be reckless as his previous fight, has something to prove to the world. That in his heart he did beat Pacquiao. Then you have Marquez a slick counter punching assassin, with a vicious body attack and precision that would make many surgeons jealous. I predict that Marquez will either stop Bradley in the later rounds or win a majority decision. The reason is simply he is just too smart for Bradley. Marquez has seen it all and been in with the very best. Dont hold his fight against Mayweather too much against him. Firstly, he faced the best boxer in this era and possibly one of the best ever and to be honest, Mayweather did have a weight advantage which at those light levels does play a major role. Marquez is also a counterpuncher who is very good at using your momentum against you. You have counterpunchers who can simply counterpunch, but the masters are the ones that use your footing, positioning and catch you when you have thrown your shot and are out of position. It’s an art. Sort of like the way Wilfredo Benitez would in his heyday. Bradley has a tendency to just want to swing and at the expense of leaving himself open and many times off balance. Bradley is looking to KO Marquez. In his mind this is the only way to vindicate his win over the Pacman. What sweeter way than to KO the man who KO’ed Pacman. Then Bradley could say see, it was not a fluke. But there is the danger. When a fighter is looking for a KO, especially against a savvy counterpuncher it spells trouble. Just to refresh your memory, Pacman got KO’ed when he was going in for the kill against Marquez. Marquez knows this with Bradley and is preparing for this. Bradley is also in way too soon. One my question the same for Marquez, but Bradley suffered serious brain trauma in his last fight. Interviews after the fight and even months later showed him slurring his words bad. He should have fought a tune up to see how he felt and how he could accommodate taking a crisp shot. I predict that the first major punch will have MAJOR impact on Bradley. There is also an underlying vendetta, though Marquez may not want to say it….BOB ARUM. Marquez is not happy at the way Arum treated him in his previous meetings with Pacquiao especially in the last encounter, making Marquez take a major cut in favour of Pacman. Guess who Bradley fights for. Marquez wants payback. Now of course this is boxing so anything can happen. Marquez is no longer a young boxer and we have seen boxers age in front of our eyes, I mean not everyone can beat father time like Bernard Hopkins. Marquez could age in a split second. I dont see that happening though. I have a lot of respect for Bradley as he is a class act, but I predict that Saturday will belong to Dinamita. Next boxing news: Lennox Lewis having fun again, says he’d come back ………….for $100million!